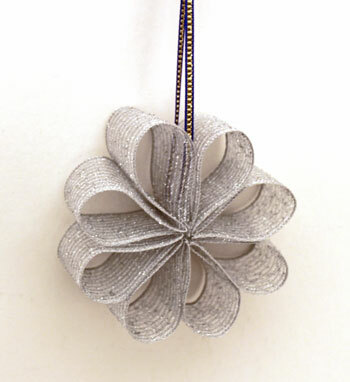 This Easy Christmas Crafts Ribbon Flower Ornament project uses a few simple and inexpensive materials and tools. It can be made quickly either with glue or with a needle and thread. 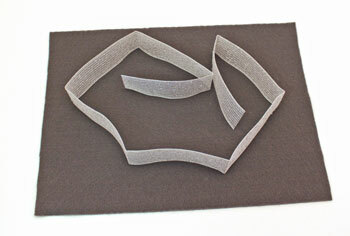 The materials and the tools are simple and inexpensive allowing you to make a few or many in a short amount of time. 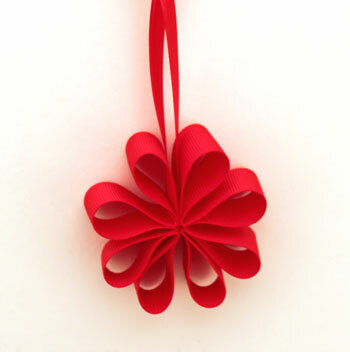 Take a look at the simple yet pretty finished Easy Christmas Crafts Ribbon Flower Ornament. The ribbon flower ornament is simple, but the finished product varies widely based on the colors and widths of ribbon used. 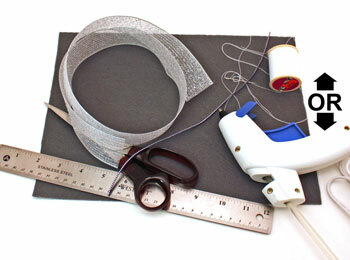 Measure and cut the 32-inch length of 1 1/2 inch wide ribbon. 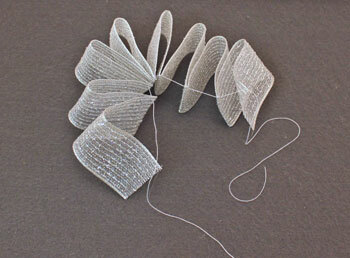 The ribbon in this example is a sparkly silver wired edge ribbon. 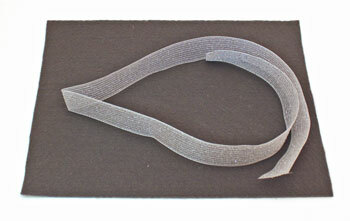 The ribbon does not have to have a wired edge, but it does need to be strong enough to hold the finished shape. Fold each half into half until there are eight segments. Make sure the folds are in the same direction. If you are not using a wired edge ribbon, use a pencil, a piece of chalk or the edge of a sliver of soap to mark the points of each fold. Use a needle and thread as shown here -OR- a glue gun -OR- tacky glue to connect the folded points together. Begin the connections on one side of the ribbon. If you are using a glue gun -OR- tacky glue, glue both ribbon edges of each fold as you go. 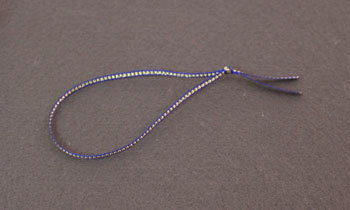 If you are using needle and thread, connect all of the folded points and the ends of the ribbon along one edge. Leave extra thread at the beginning and the end. The ends will be tied later, but the ribbon can become tangled if you tie the threads at this point. Turn the ribbon over and connect the folded points and the ends of the ribbon on the opposite side with another length of thread. 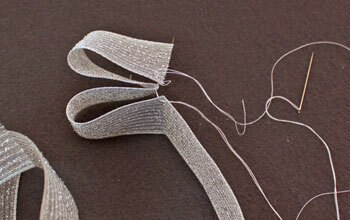 For each side separately, pull the thread ends to gather the folded ribbon together. Tie a knot with the ends of the threads on each side. Do not cut the thread ends. They will be used in another step. Tie the ends of the narrow ribbon to form a loop. 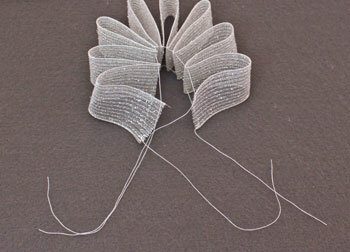 Place the narrow ribbon loop over the ribbon flower ornament between the ends of the wide ribbon. Tie the threads from each edge into a knot over the narrow ribbon to hold the narrow ribbon loop for hanging the ornament. If you are using glue, glue the narrow ribbon loop in the middle of wide ribbon. Trim the thread ends leaving 1/2 inch thread above the knot. 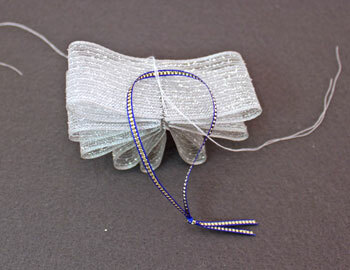 The extra thread will be hidden inside the ornament and helps prevent the knot from coming untied. 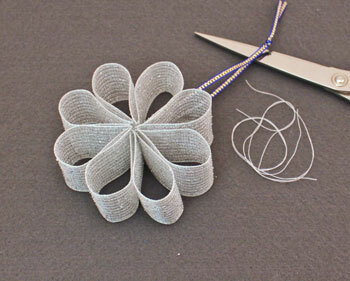 Form the petals of the flower by opening the loops of wired ribbon and shaping the edges. 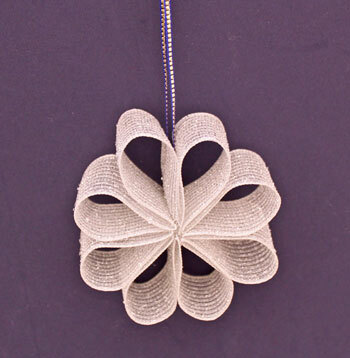 Hang the simple yet pretty ribbon flower ornament to add sparkle on a Christmas tree or anywhere for some holiday smiles. This next version of the ribbon flower ornament uses a red grosgrain ribbon for the flower and a red shiny satin ribbon for the hanging loop. Try different ribbons in varying widths. 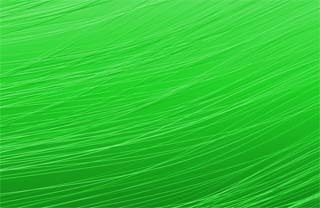 Adjust the lengths of the ribbon based on the width and type of ribbon. More narrow ribbons require less length to form a full flower. 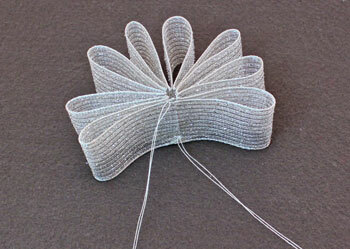 For example, the grosgrain ribbon flower ornament used 24 inches of a 1-inch wide ribbon and made a smaller but still full flower. People of all ages can enjoy this easy Christmas crafts project using bits of ribbon and a small amount of time. This Easy Christmas Crafts Ribbon Flower Ornament uses simple and inexpensive materials and tools making it fast, fun and easy for anyone to do.